Infamous Parselmouth Lord Voldemort communicating with his snake, Nagini, coiled around him. Parseltongue is, when spoken, a hissing sound, similar to that of a snake; as such, normal people cannot understand it. Aside from serpent-based creatures, Parselmouths can communicate with each other with the language, as Harry understood Tom Riddle's commands to the Serpent of Slytherin, and the House of Gaunt communicate with each other almost exclusively in Parseltongue. While inherited, Parseltongue usually requires the speaker to face a snake-based creature or object shaped like a snake (e.g. a carving); more proficient speakers may be able to speak it at will, as the Gaunt family was very proficient in the language - enough so for Morfin to speak to Bob Ogden with it, while Voldemort could speak to the Statue of Slytherin to release the basilisk. The ability to actually speak Parseltongue — not just imitate it as Ron Weasley did — is considered an attribute of a Dark Wizard, which is partly due to the fact that both Salazar Slytherin and Lord Voldemort possessed this ability. Another notable Dark Wizard who was also a Parselmouth was Herpo the Foul. However, as Albus Dumbledore pointed out, there are Parselmouths among the good as well, the most well-known of which was Harry Potter. Paracelsus a notable alchemist and a "medical genius" is credited with the discovery of Parseltongue in the sixteenth century, despite the existence of speakers like Herpo the Foul or Salazar Slytherin in the classical and medieval ages. 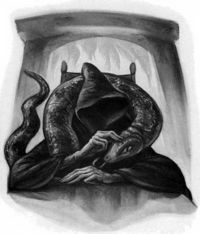 An unknown member of the Dark Force Defence League once stated when asked regarding the matter by Rita Skeeter - "Personally, I would be highly suspicious of anybody who could converse with snakes, as serpents are often used in the worst kinds of Dark Magic, and are historically associated with evildoers." Lord Voldemort passed the ability to speak and understand Parseltongue on to Harry Potter when he attacked him in infancy in 1981, inadvertently and unknowingly making him into a Horcrux. Harry first experienced conversation with snakes at age ten when he was taken to the zoo with his cousin Dudley Dursley and found himself communicating with a snake while in the reptile exhibit. Harry inadvertently caused the glass of the snake's tank to vanish, enabling it to escape. When the glass returned, he trapped his cousin Dudley inside the tank whilst laughing at him, and not knowing what to do about it. Harry was not consciously aware of his ability to speak Parseltongue until 1992; he was pitted against Draco Malfoy in the Duelling Club and was able to communicate with the snake Draco conjured to attack him, telling it not to attack Justin Finch-Fletchley. This caused hysteria among his fellow students because graffiti on the walls of Hogwarts Castle foretold that the Heir of Slytherin would open the Chamber of Secrets, unleashing a monster that would attack the school's Muggle-born students. The Heir of Slytherin was in fact Voldemort, but Harry was able to gain access to the Chamber by speaking the password in Parseltongue, and subsequently killed the basilisk within. It was shortly after this incident that Harry learned how he acquired the ability. When the wizarding world discovered Harry's ability to speak Parseltongue, courtesy of Rita Skeeter, people began to doubt his words, as Cornelius Fudge refused to believe Harry's claim of Voldemort's rebirth partially due to being prejudiced to Harry's ability to speak the language. Harry also used his skill in Parseltongue to open Salazar Slytherin's Locket. When Harry, Ron Weasley, and Hermione Granger returned to Hogwarts to search for Voldemort's final Horcrux, Ron managed a weak imitation of Parseltongue to re-open the Chamber of Secrets so that he and Hermione could fetch basilisk fangs, which Hermione used to destroy Helga Hufflepuff's Cup. After Lord Voldemort destroyed the fragment of his soul residing in Harry, Harry lost the ability to speak Parseltongue, about which he was glad and relieved. Ginny Weasley was able to speak Parseltongue while she was possessed by Tom Riddle's Diary, which enabled her to open the Chamber of Secrets. Ron Weasley was also able to open the Chamber of Secrets during the Battle of Hogwarts by imitating a fragment of Parseltongue he had heard Harry Potter use to open Salazar Slytherin's Locket, though it took him several tries to make it work. Albus Dumbledore could understand Parseltongue, but was unable to speak it. Bathilda Bagshot's carcass spoke in Parseltongue while it was occupied by Nagini. J. K. Rowling has stated that she took the name Parselmouth from an "old word for someone who has a problem with the mouth, like a hare lip". When Harry Potter and Hermione Granger went to Godric's Hollow in 1997, Nagini (inside the corpse of Bathilda Bagshot) tells Harry to "Come!" from the next room in Parseltongue. In reaction, Hermione jumps and clutches Harry's arm, and the two of them obey the command. It is unknown how Hermione seemed to understand this command, though it could be that she did not hear it well, and merely followed Harry. She could also have been frightened by the hissing sound she heard and then followed Harry. In the Philosopher's Stone film, Harry converses with a Burmese python, rather than a Boa Constrictor. Whenever it was spoken in the films, Parseltongue went untranslated except for one scene in Harry Potter and the Deathly Hallows: Part 2 when Voldemort was speaking to Nagini, where it was given subtitles. It was also heard in English in the first film when Harry was talking in the Zoo. In the films, Parseltongue is depicted as sounding like a sibilant-filled language with readily discernible phonemes created by Dr. Francis Nolan (as listed in the credits for Harry Potter and the Deathly Hallows). In the novels, it is only ever described as a low hissing noise. In the films, as Harry draws near a Horcrux he can hear, in addition to a whining noise, a faint voice which seems to speak in Parseltongue. It is possible that Parseltongue comes in variants for different languages, rather than being understood as the language spoken by the Parselmouth. The boa constrictor that Harry Potter converses with at the Zoo uses the Portuguese word amigo rather than the English friend. It is currently unknown whether there are any remaining Parselmouths in the Wizarding world, though it is possible that it could be a dead language like Latin. Since Harry was a parselmouth because of the fragment of Voldemort's soul in him, it is possible that he could've commanded the Basilisk if he tried. Although in the film version of the Chamber of Secrets, the version of Voldemort emitting from his diary claimed that the Basilisk would not listen to harry's commands in Parseltongue as it would only obey Lord Voldemort. Parseltongue translator - an official translator into Parseltongue. Parseltongue-inspired - Provides a hypothetical, written breakdown of Parseltongue in universe. This page was last edited on 13 July 2015, at 12:37. This text is available under the GNU FDL and may have been adapted from the Wikipedia article about Parseltongue (history).